If Santa failed to deliver the Tablo OTA DVR that was on your wishlist, don't worry! We're offering great deals on refurbished 2 AND 4-Tuner Tablo DVRs during our Boxing Week sale! 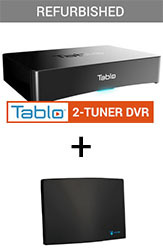 And we're also offering refurbished 2-Tuner Tablo DVRs as bundles with brand new passive or active indoor antennas. There is limited stock available, so make sure to get in on these deals before they're gone! Refurbished Tablo OTA DVRs are lovingly restored to a like-new state here at Tablo HQ. We make sure they work properly and that the boxes include all parts and accessories you'll need to get up and running. Also, refurbished Tablo units still include the 30-day trial of our guide data subscription and are covered by Tablo’s 12-month warranty policy. However, these units are NOT eligible for Tablo’s 30-day return policy which is standard on all new units.